Summer in Chicago is known to be hot and steamy. When it comes to those really hot and humid summer days, these are the items that I make sure to have on hand. It's inevitable that when the temperature begins to rise, that hair and makeup are both bound to melt away. I like to switch my routine to a little more low-maintenance and light weight beauty products. I also like products that are going to give me more of a natural glow. This cream eyeshadow product is so creamy and so long-lasting. It's super easy to blend and takes two seconds to take your eyes up a notch without feeling like you have a lot of make up on. I have this stick in 4 different colors and love how easy it is to apply. It's very build-able and I can easily mix and match different colors. I don't typically wear eyeliner so I just use the darkest shade of these and smudge it outward and I'm good to go. Plus, it really does have eight hour wear so it will definitely stay put on those 90 degree days. This is one of my all time favorite makeup products. I definitely use it year round, but find myself reaching for it nonstop in the summer months. It is a neutral, cream bronzer that goes on so smooth. It is definitely on the expensive side, but I swear a little bit goes a really long way. I bought mine last summer and have yet to be close to the bottom. It's easy to add a light layer or build on for more of a summer glow. It is not shiny or shimmery so it really gives you a 'glow from within' kind of appearance. Sunscreen seems like a no brainer in the summer. My skin is known to be extra sensitive to sunscreen so I'm definitely really careful about what I use. I bought this sunscreen before our honeymoon to Hawaii and had no issues with my skin (a miracle!). The consistency is surprisingly light and won't give your skin the white cast that you see with most sunscreens. It also dries really quickly without leaving you with that usual greasy feeling. I'm a little obsessive about over researching products before I actually purchase them, especially beauty products. And this is one that has great reviews on Nordstroms and Sephora, especially at this price point! I just picked up this product from Sephora in the last few weeks and it quickly got me excited for summer. This spray smells amazing and works magic on frizzy hair without making it feel weighed down. This spray is great if you have naturally wavy or curly hair to take away the summer frizz that you get when it's 100% humidity. It's great for that undone, beachy look. I have a mild obsession with trying Herbivore products lately and love a good face mist. I'm definitely not one to overexpose my skin to the sun so I don't use this to treat a sunburn. It's really lightweight and moisturizing without leaving that sticky feeling that you can sometimes get from face sprays. It's great for dry or irritated skin even if it's not from a sunburn.There isn't a strong smell to the mist, just really fresh. I'd be remiss to talk about summer beauty products and not mentioned a self tanner. I do all that I can to stay out of the sun and use sun protection, but I don't like missing out on the summer glow. I've tried out a lot of self tanners over the last few years and keep going back to St. Tropez, particularly their tanning mousse. I have found that this has the most staying power and is so easy to apply that you really can't mess it up. It's hard to think of sunless tanner and not be scared of looking orange or splotchy, but I've found that with the mousse consistency and a applicator mitt it is so easy to apply. I've tried the express and the extra dark versions of the St. Tropez line and I really like all of them. They do have a smell to them (not a bad smell, just the usual self tanner smell) so I wouldn't recommend sleeping with this product on. I like to use it on a day that I'm working from home and can leave it on during the day and then wash it off before bed. I could do a whole blog post on all of the different self tanners that I have tried! Monday, we meet again.. I can't believe it's already May and almost Memorial Day! Memorial Day to me means the start of the summer and the start of more permanent warm weather. I thought it would be fun to pull together some favorites for the long weekend. 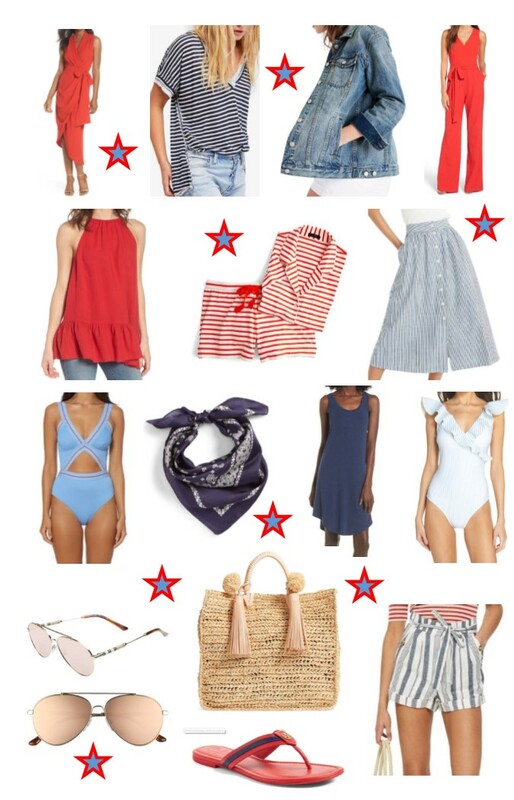 I know a lot of people spend the weekend at a lake house or by a pool so here are some of my Red, White and Blue summer favorites! We haven't figured out exactly what our plans are for Memorial Day, but I'm hoping there is lots of sunshine! I hope everyone had a great Mother's Day! Weekends have been flying by way to quickly for us lately even though they haven't been jam packed! We had a nice and relaxing weekend since we had cold, rainy weather here. We even took a nap through the storms on Saturday afternoon. I have refused to turn back on our heat so we've relied on our fireplace to heat up our place and surprisingly it'd done a great job keeping up. I thought it would be fun to round up some of my recent instagram posts to link where all of the items are from. Let me know what you think of posts like this and I can start doing them more often! 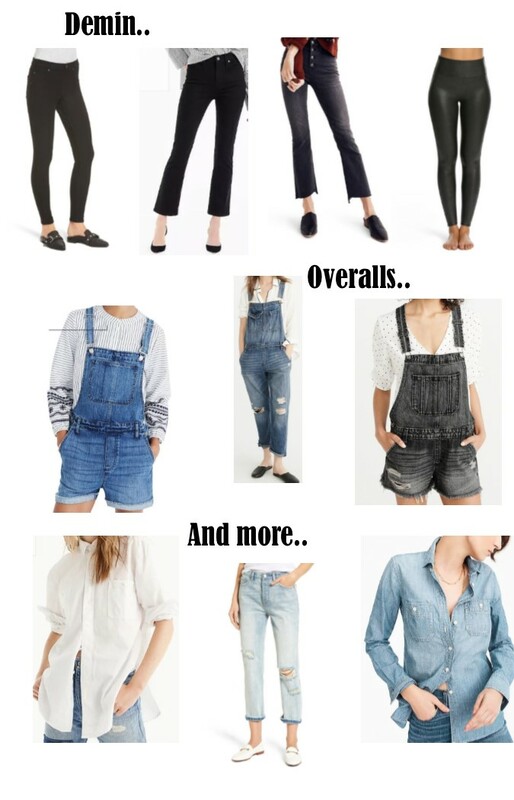 Each photo has an outfit widget below that should have a link to everything that you're looking for! Happy Friday Eve! I'm about to start the last year of my 20's. Part of me feels like I've hit a lot of my bucket list items and part of me feels like I'm just getting started. I thought it would be fun to share 29 facts about me that most of you may not know! Year 28 will be a really tough year to beat with getting married and buying a house, but here's to trying! I was born and raised in Iowa. I moved to Chicago as soon as I graduated from college at 22. 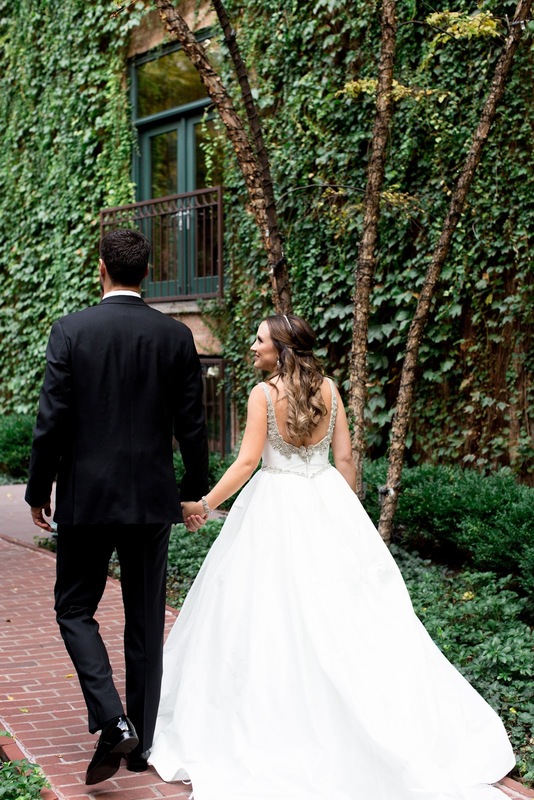 I married the love of my life this past November after dating for 6 years. My husband is my best friend and I truly don't know what I'd do without him. 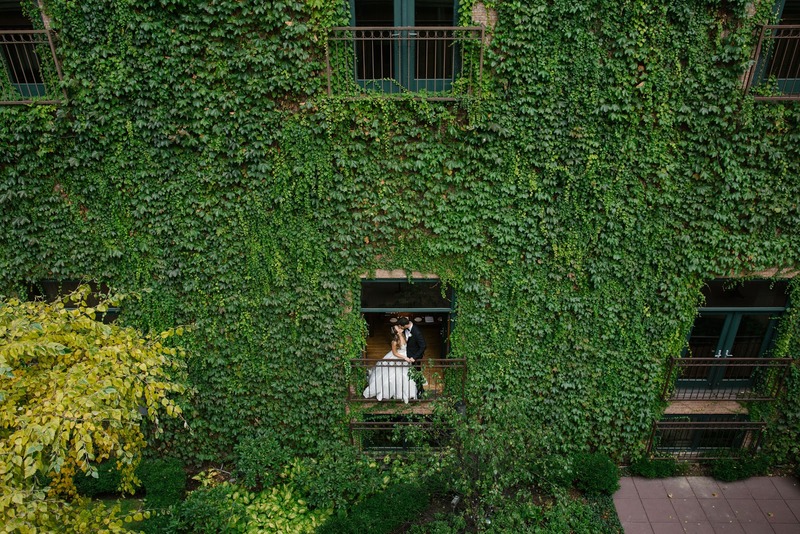 We recently bought our first place in Geneva, IL and have loved exploring our new city. I have a brother and sister and step siblings on both sides since my parents have both remarried. My niece and nephew are my favorite people ever. I Facetime with them daily even though they aren't even old enough the carry on a conversation with me. I have run two marathons, the Chicago Marathon and the Nashville Marathon. I love warm weather and hate the long, dark Chicago winters. I have naturally curly hair, but got a Brazilian blowout last year and it has yet to grow out and get curly again.. I'm 5'4 and my husband is 6'5, it's quite the height difference. I love flowers, but have a really hard time keeping them alive. Country music is my favorite. I am an Olympic level sleeper. I can sleep for endless hours and often get at least 9 hours of sleep per night. I'm highly allergic to dogs and cats and am really awkward when I'm around them. No tattoos and no broken bones. I would love to be a better cook, but it just seems like so much work. I love to watch documentary's and murder mysteries, but stand up comedy is my absolute favorite! Friends is my absolute favorite TV show and I've seen every episode at least 3 times. I am a Hawkeye! I graduated from the University of Iowa with a degree in Marketing. I also have my MBA from DePaul University. I love to organize. Whenever I am overly stressed, you'll find me randomly cleaning or organizing a closet. I love all food except beans, mushrooms and olives. My favorite food is Mexican or sushi. I have a bad habit of checking the Nordstrom new arrivals section almost daily. I love to try new beauty products, but don't like having clutter so I try to keep a curated beauty collection. I'm a homebody. You typically won't find me out at a bar on a Saturday night, but I do enjoy spending time with friends and being social. I hate roller coasters and get motion sick really easily. I carry Dramamine around me with at all times just in case. I also am not a fan of scary movies and haunted houses. Halloween is by far my least favorite holiday, because I'm a wimp about scary things. 8 Favorite Spring Dresses for Any Occasion! It's no secret to those who know me that I love dresses. Spring seems to be filled with plenty of wedding showers, baby showers, Monday's Day brunches, birthdays and any other excuse to wear a pretty dress. I've pulled together bunch of my favorites. 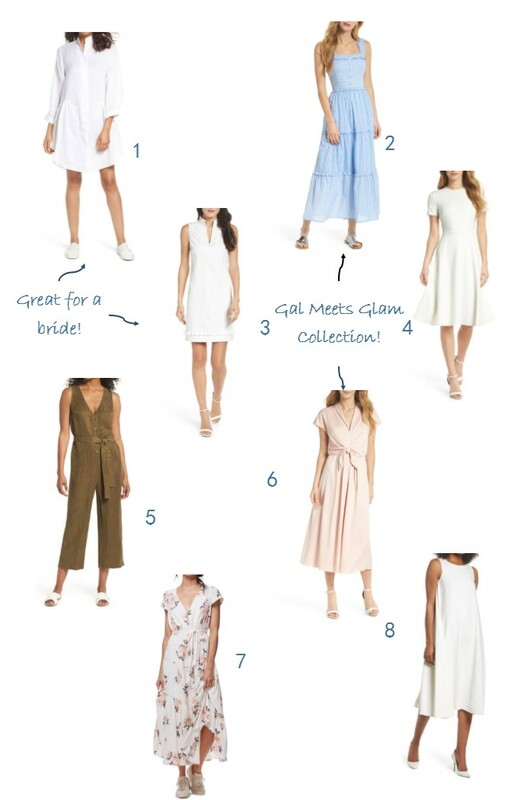 I could have easily filled this whole post with the new Gal Meets Glam dress collection at Nordstrom. I love the whole collection. It has a lot of fit and flare dresses that are mid length and that's right up my alley. I have been reading the Gal Meets Glam blog for years so I was really excited for this collection to come out and it definitely did not disappoint. Julia, the creator of Gal Meets Glam, has such classic and timeless style so I knew this collection would be filled with really classic pieces in beautiful girly colors. Perfect for any spring occasion! Happy Friday Everyone! It's been one of those weeks that seem to last forever so I'm extra happy that it's the weekend. We have nothing special planned and it's supposed to be 80 and sunny so I'm sure that we'll take advantage of the weather. I've mentioned my love for overalls a few times on here, but I love to throw up a graphic tee with my overalls. Here are a few of my favorites.. I mentioned this on my instagram stories, but we watched this documentary on Sunday night and it was really good! If you haven't checked out this documentary, I highly recommend it. We spent last Saturday on the hunt for patio furniture. I think we literally went to 15 stores looking for outdoor furniture. We ended up with this table Target that really fit the size of our patio. There is a little assembly required, but nothing too strenuous. So if you're in the hunt for patio furniture, I definitely recommended checking out Target. Now I'm on the hunt for an outdoor run and some tabletop decor! I recently purchased a jade roller from Nordstrom and I'm anxious to try it out. I feel like I have seen them a million places and figured it was worth trying out. Compared to many 'beauty tools' this seems like the most inexpensive option with the biggest bang for your buck! I've read to keep them in the fridge and that they're great for depuffing your face. I'll report back once I've tested it out for a while! Shameless plug, but I'm trying to be more active on my Instagram stories so if you don't already follow me there - click here!! I'm enjoying getting more interaction with all of you through Instagram! I feel like I have mastered my checklist of what I will need in my carry on bag for a flight. It may seem like a lot, but it's always nice to have more than you need with how unreliable travel can be. Here are the items that I always like to have with me when I fly whether is for personal or professional travel. I like to travel with a few different pouches within my larger bag so that it's easy to grab for items without feeling like my bag is a bottomless pit. Electronics pouch - I like to keep any cords, charges and small devices that I'll need for travel in one case. Usually this pouch consists of a backup battery pack (a must have when traveling), phone charger, apple watch charger, hotspot, headphones and camera charger. I try to keep all of the cords cleanly wrapped by either using extra hair ties or a cord clip. Cosmetics Pouch - Sometimes I will carry my full travel makeup bag in my tote if I am tight for space in my carry on bag, but either way I usually have a small cosmetics pouch to carry the essentials. This pouch usually includes a few lipglosses, lip balm, extra hair ties, hair clips, blotting papers, Dramamine and ibuprofen. I usually carry this cosmetics pouch with me whether I am travel or not, but like to throw in a few extra items when traveling. Travel Essentials Pouch - This pouch usually contains miscellaneous items that I only carry when I'm travel. 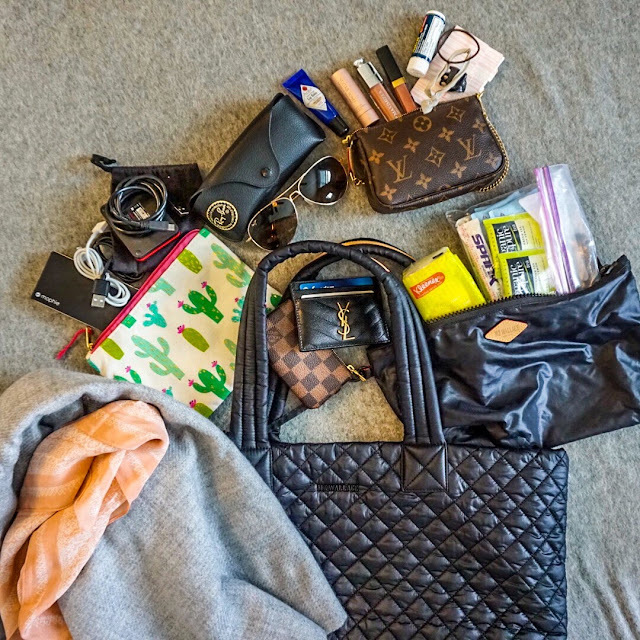 I like to throw in a few tea packs, travel Spark pouches, Kleenex, granola bars, and usually some extra sunglasses, especially if I'm going somewhere warm and sunny. Card Case - I like to make sure to downsize my wallet when traveling. I usually switch to a small bag when I reach my destination so I want to make sure that I have a wallet that will easily transfer into other bags. I love a simple card case, because I usually only need my ID and a few credit cards. Tote - I recently purchased this MZ Wallace tote after reading about so many others recommending this and now I understand the hype. This bag is so versatile and especially great for a beach vacation since you can easily wash the bag or wipe it clean. I now even use this as my workbag on days that I head downtown since it holds so much and I love that it has a zipper closure. 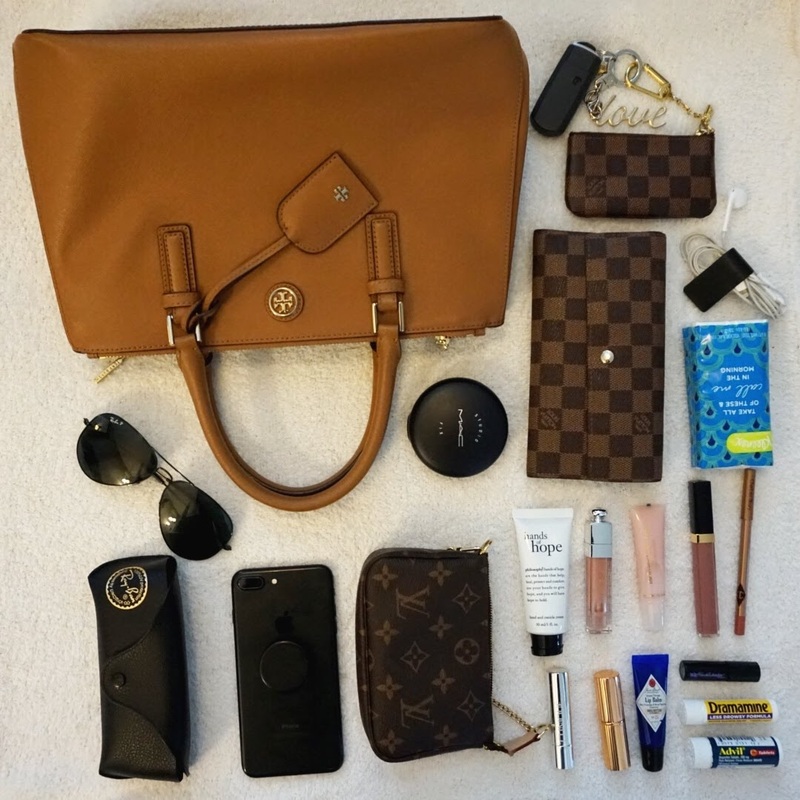 I love to use my Louis Vuitton Neverfull bag, but it makes me nervous when traveling if I don't have a zipper on my bag so I love how secure this bag is with the big zipper closure. Large scarf - I usually travel with at least one large scarf and sometimes an oversized cardigan as well. I like to throw these on the top of my bag, because 9 times out of 10 I get cold on an airplane or am dying for a 'pillow' so that I can get some sleep. 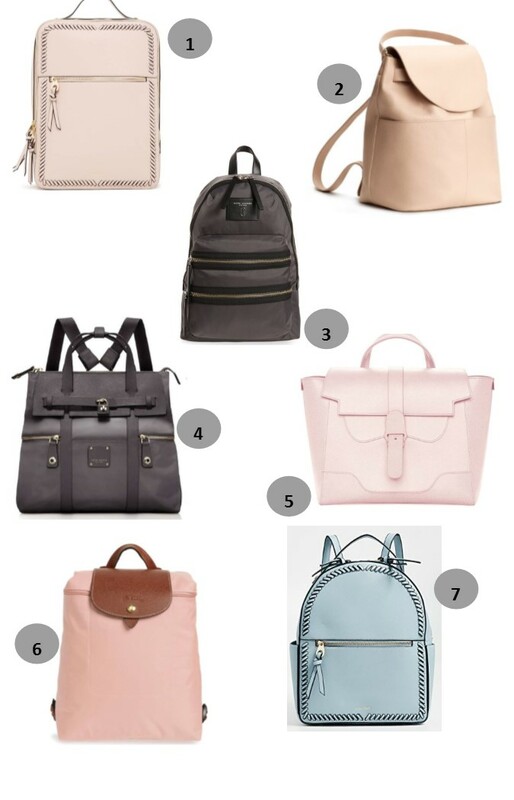 I recommend picking one that is a neutral color and one that will match most of the clothes that you have packed, because you'll probably want something to easily throw on at night when you get to your destination as well. Computer, computer case, and computer charger - not pictured in this photo, but I don't remember the last trip that I took and didn't take my computer. I usually end up buying wifi on the plane and getting some work done. I've heard of people that swear that they get their best work done on an airplane since it's so uninterrupted and peaceful. I like to make sure that my computer is handy, because as soon as the wifi light goes on, I usually fire up my laptop. Happy May Day! I used to love 'May Day' growing up. We always had friends in elementary school and middle school that would leave flowers or a little basket on our front porch. The start of a new month always feels like a fresh start and May 1st has always felt like the beginning of warm weather. The weather today is supposed to be 80 and sunny! 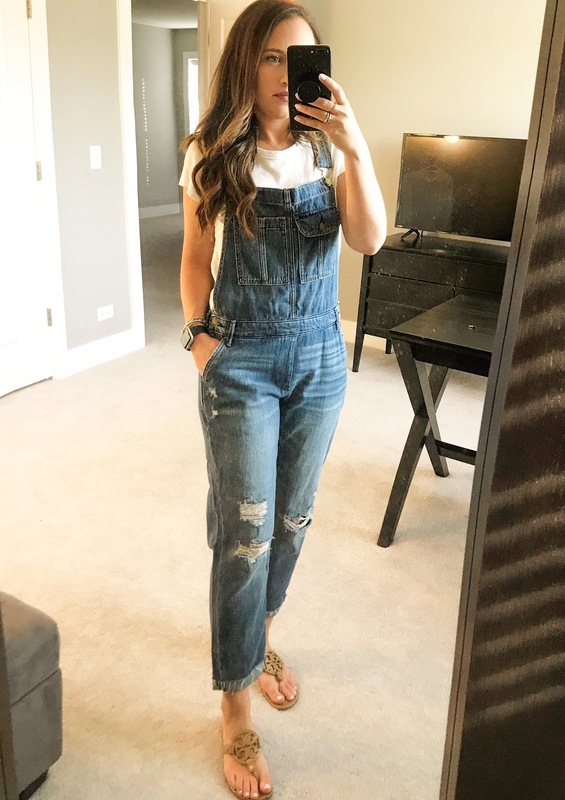 There are two things that I'm loving this spring: overalls and backpacks. It's bringing me back to elementary school days and I just can't enough. It finally feels like spring is here. We had beautiful weather this past weekend and really tried to get outside and enjoy it. We even went and bout new patio furniture since we have a bigger deck on our new townhouse. I can already picture us sitting out there nonstop this summer. We are supposed to have even nicer weather this coming weekend so Friday can't come soon enough! With the transition to warmer weather, I like the pair down my everyday makeup routine. I typically don't wear much unless we are headed to an event. I try to spend as much of the week makeup free as possible, but this is what I wear on the days that I head into the office or am running around town. I concentrate more on evening out my skin-tone and making it more of a no makeup makeup look. This routine also includes lots of SPF which I think is so important this time of year! CC Cream - If you have not tried this cc cream, add it to your next Sephora haul. It has such a great natural coverage. It is a lot more full coverage than I was expecting when I first tried it, but it feels so light on your skin. There are limited color options, but don't let that deter you, becuase it's easier than you think to find a good match. I sometimes mix the 'light' and 'medium colors if I am a little more tan or self-tanned, but usually can just wear the 'light' shade. I also love that this has SPF 50 included in it. Concealer - Another item to add to your next beauty haul if you have not tried this concealer. This concealer is amazing. It is so full coverage and hydrating. I can have really dry under-eyes and some concealers just extenuate the problem, but this one has great coverage and actually looks like my skin. This concealer is thicker than most so a little bit goes a long way and it's really build-able. So if I want something more dramatic for nighttime, it's easy just to apply more. I also have a few colors of this depending on how tan I am and whether I am using it for my under-eyes or spot concealing. I have also tried the matte foundation version of shape tape and really like that as well! Under Eye Corrector - I use this as the very first step of my makeup routine before I even put on foundation. It is a mircle worker in getting rid of dark circles. It has a really creamy feel so I usually just put it on with my ring finger and press it lightly on my under eye. You only need a little bit to see a big difference. Perfecting Micro-Powder - I had a hard time picking between this product and the next one as a setting powder. I honestly use both of them if I'm putting anything on my face. This is the lightest powder I've ever used. You honestly can barely see the little micro-powders, but it does a great job of keeping your makeup set in place. I especially use this powder to set my under-eye concealer. 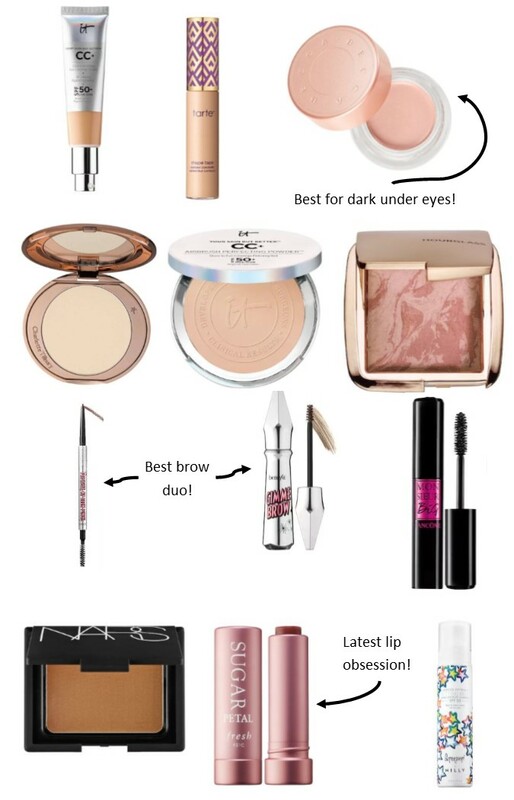 I don't like the use anything heavy in my under-eyes, because I feel like there is already enough product there with the color corrector and concealer. I have yet to find a Charlotte Tilbury product that I don't like. This brand is not sold as Ulta or Sephora, but you can easily find it at Nordstrom with free shipping and free returns! CC+ Perfecting Powder - Another product with 50+ SPF and really build-able. I use this to set my makeup after putting on CC cream. This is great even on it's own so it's great to travel with, especially on a beach vacation, because it's easy to just thrown on this powder and you'll have 50+ SPF ready to go. I like to use this to add a little more coverage in area that I want to cover. Blush - I love this blush for everyday. I use it in the color 'Mood Exposure'. It's such an easy blush to blend out. I sometime struggle with blushes not looking natural or easily looking like you applied too much. This blush is so natural and blends easily into my bronzer. I originally received this in the sample size as a free gift from Sephora and knew I'd be purchasing the full size. I think this is just a great universal shade for any skin-tone. Brow Pencil and Brow Gel - I recently got my brows tinted and it was honestly a game changer in making it that much faster to do my makeup. This look so much more natural so if you haven't tried tinting you brows and you have light colors brows like I do, then I can't recommend it enough. I love these two products to fill in my grows. I honestly don't spend more than 20 seconds filling them in and throwing on a little brow gel to hold them in place. I've tried a million different brow products and love these the most, because of how quick they are to use everyday. If I'm going to an event or a night out then I may spend a little more time, but for everyday, these products work great! Mascara - If you follow me on instagram then you know that I've been on a recent hunt to try new mascaras. I love my go-to DoubleWear Lengthening Mascara, but want to find something that may give me a more dramatic lash look. I don't typically wear eyeliner or shadow on an everyday basis so I want to find a mascara that will give me more dramatic lashes. Jury is still out, but I'm loving this new to me mascara from Lancome. I first was impressed with Lancome when trying out their eyelash primer so I figured I should give their mascara a go as well. Bronzer - I've mentioned this bronzer a few times on my blog. This is definitely a holy grail for me. This is the first bronzer that I have completed used up and currently need to restock! It is a matte bronzer so it's great for contouring, but honestly just gives you the most natural glow. Can't recommend this enough! Tinted Lip - I've had a few colors of these tinted lips for months and recently pulled those out for my most recent beach trip and fell back in love with them. I have a really hard time with lipstick being too drying for my lips and this tinted lip is so hydrating. It even has SPF 15 so it's great for this time of year. I have the colors 'Petal' and 'Honey' and they're the most natural colors on your lips. It goes on like a lip balm, but gives you lips the prettiest color! Setting Spray - My love for the Urban Decay All Nighter Spray is not gone and that's still a staple for me, but I recently tried out this Supergoop X Milly Setting Spray and love that is has SPF in it. So it's great for those days when you know you'll be out in the sun a lot and want to have some extra coverage. You can tell from this post that I'm all about the sun protection and I love that you can continue to spray this throughout the day or as the refresh to ensure you have an SPF on your face. It smells minted and fresh. Happy Friday! Mother's Day is fast approaching - May 13th! It always seems to sneak up on me, especially since it's right around my birthday! Mom's can be so hard to shop for, but here are a few gift ideas to make sure you're prepared. Who can't use a nice picture frame with a fresh picture in it? This is especially a good gift if you recently had a big life event and have some good photos that would be worth framing such as a wedding or the birth of a child. Nowadays with a million pictures on your phone, it can sometimes seem like so much work to get a picture developed and put into a frame. This is a great opportunity to do that work for them and have nice photos taken. Bonus points if you get professional photos taken with your siblings to frame for Mother's day! I think jewelry can be such a classic items to get Mother's. It's something beautiful for them to wear to remind them of their children, it seems like a no brainer, but it's important to know your Mom's tastes. It's usually more safe to get them something classic and something that they wouldn't feel like they have to wear all of the time. Bonus points if you join them for the spa day to spend time with them. I think this is a great two birds with one stone, you get to go to the spa and you get to treat your mama for Mother's Day. 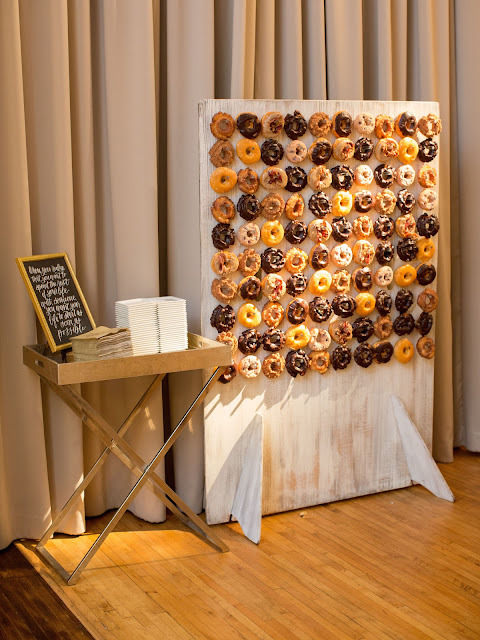 It's a great way to spend time together without all of the distractions and a great way to treat them for their special day. This is especially good timing since it's about to be flip flop weather so you know you'll both be wanting a pedicure soon anyways. Find a good day spa in your areas or even just book pedicures for the day, but make sure to make an appointment, because I know nail salons usually get really busy on Mother's Day! These are sometimes items that we can easy neglect or not want to spend money on ourselves, but a nice pair of slippers or PJs can easily feel like heavy. My mom has always been a big slipper wearer, and can wear them out pretty quickly. The last few years we have gifted her a new pair or slippers and she always loves them! A nice, fluffy robe is always a really nice gift as well. You can find some really nice and soft robes that are not cheap so it's nice to splurge a little for her and get something that's higher quality than she may spend if she were busying it herself. 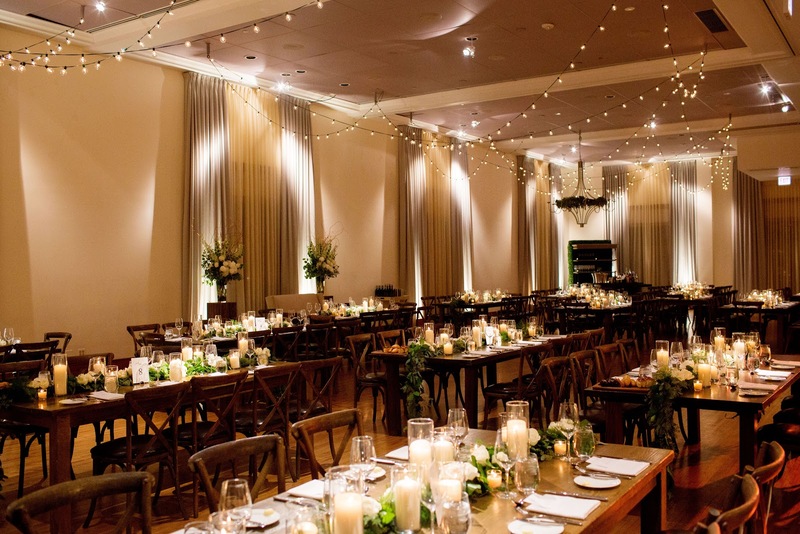 It doesn't take long after your engagement for the questions to begin on locations, dates, venues, so it's easy to feel like you need to have all of the answers right off the bat. Enjoy being engaged. 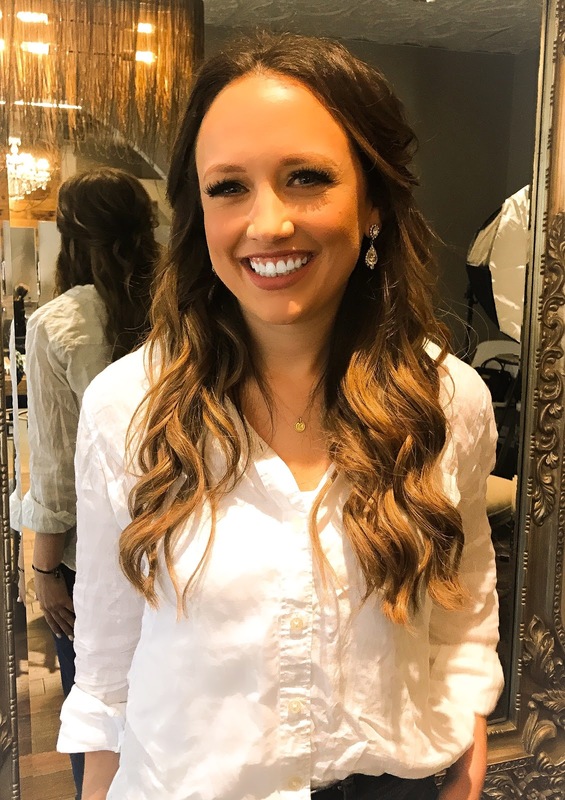 Once you start planning the wedding, it starts to snowball into having to make all of the decisions and every little detail everything falling into place. Before you even start planning, enjoy the engagement phase. Get used to calling each other "fiance" for a little while. Unless you're someone that already knew your wedding venue, then go ahead and book a date, but if you're like we were and couldn't even nail down a city, take your time. Don't feel the rush and panic, because things will fall into place as they should and when they should. We got engaged right before the holidays which was great, because it meant that we didn't get a million questions about when we were getting engaged, instead we got a million questions about when and where our wedding would be. Don't let this pressure make you feel like you need to have all of the answers. I have friends that had short engagements and friends that had long engagements, and guess what.. they're all married regardless of how long it took for them to walk down the aisle. You'll figure out how much time is right for you, but don't feel like you need to have all of the answers. There are literally a million different ways and locations to get married and to spend money on a wedding. At some point you'll have to prioritize where you want your time, money and resources to be dedicated. It's best to have those tough conversations with your spouse before the planning process begins. When we first started planning, we threw everything on the table: Destination vs. Local, Band vs. DJ, Big vs Small. There is no right answer to any of these and ultimately, I think we would have been happy with any of these, but we had to have the conversation so that we could understand what the other person wanted. We ended up deciding to have our wedding in Chicago, local to where we lived, and an easy city to travel to for all of our out of town guests. We decided to have a band, because we love the vibe and energy that a band brings to an event. 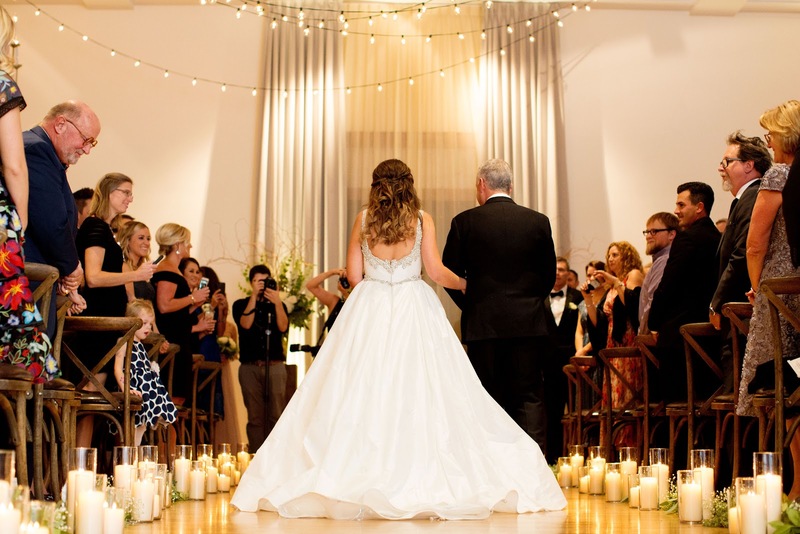 We decided to have a fairly large wedding (large to us, about 150 people), because we really wanted all of our close friends and family to be there. But all of those decisions didn't come easy or without thorough discussion. 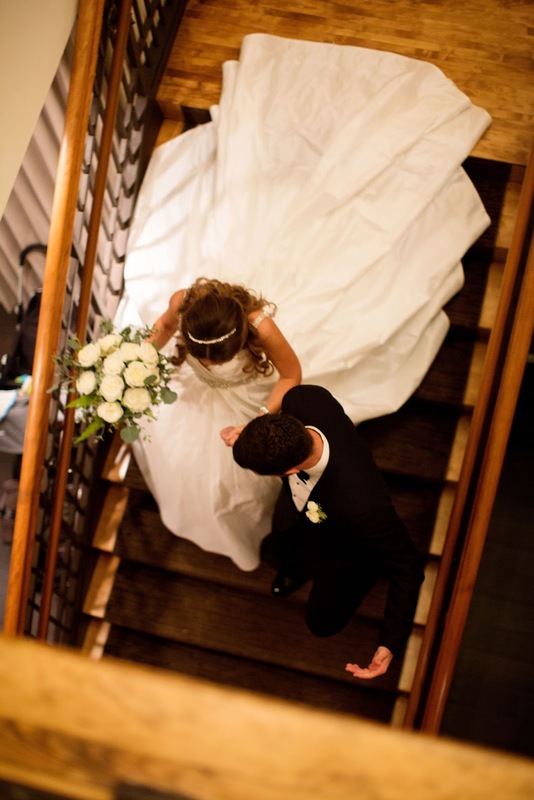 Keep in mind that these are decisions between you and your future spouse, and should be a joint decision. You make a lot of big decisions when wedding planning and it's easy to get caught up in trying to please everyone. It's easy to start thinking about what location or timeline would be the easiest for everyone else. You can easily forget that ultimately this is about you and your new husband and everything else will fall into place. This applies to everything when wedding planning: city, church, food, date. It's nice to be accommodating to friends and family, but ultimately, they will be happy if you're happy. It's easy to get stressed about every little detail, but that's not what you're going to remember in 5 years. This is especially important to keep in mind in those last few weeks before the wedding and the actual day of. 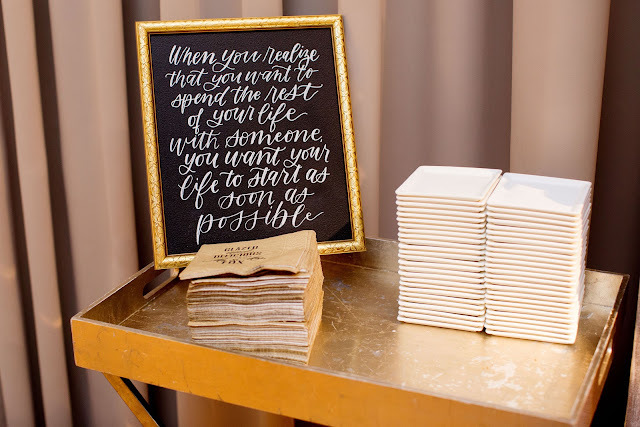 It can feel overwhelming and it's easy to get caught up in making sure everything runs smoothly, but remember that at the end of the day, regardless of all the little details, you'll be married, and that's what matters. It's so easy to get caught up in the details and forget that they're supposed to be fun and it's supposed to be a celebration. You can do a little or as much as you want when it comes to the little things at a wedding. 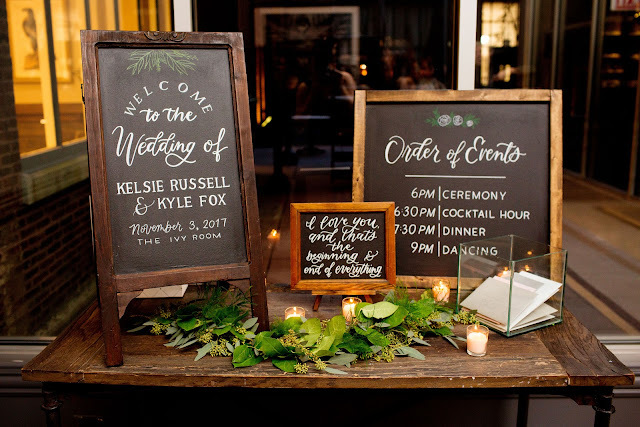 For instance, it's easy to stress about wanting little touches at the wedding to reflect you as a couple, but there should be fun in that. 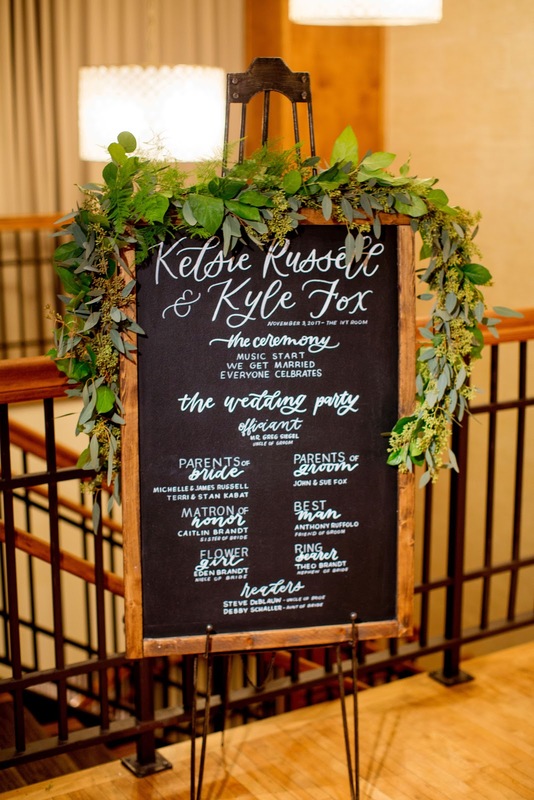 I was stressed about having love quotes on chalk boards throughout the venue, and probably spent too much time than I needed to to make this happen. Remember that the details are tiny, and not what you will remember about the event. If it isn't fun for you to plan or coordinate, then just don't do it. You'll have enough to stress about that you don't need to add unnecessary stress to what should be a really positive day. Here are a few more pictures of the details from our wedding! Happy Monday! I hope everyone had a nice weekend. We had terrible cold and rainy weather so the weekend was consumed with lots of hibernation and anxiousness for spring to finally get here. Over the years of working out, everything from running to yoga class, I've learned the type of workout clothes that I always reach for. I have a few requirements when looking at workout clothes, I don't like having hoods on my tops and I don't like my tops to be too tight. I've really edited down my activewear collection over the year to really be the items that I'm most comfortable working out in. 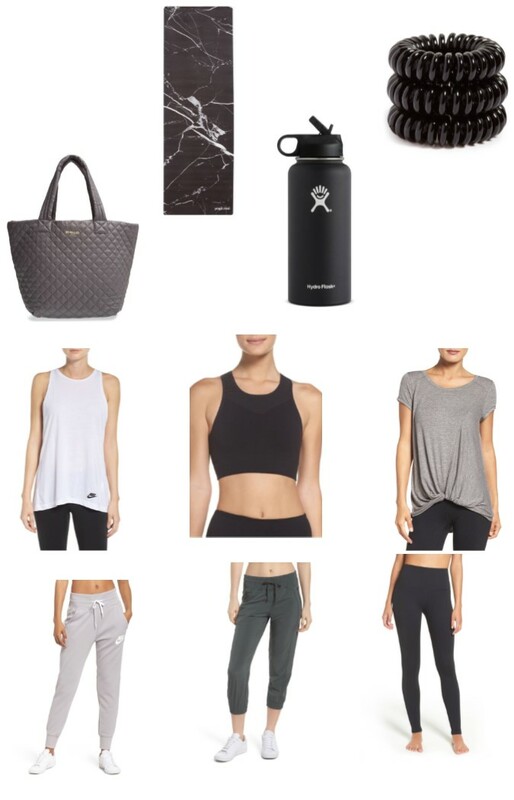 I've found a love for neutrals items that I can easily mix and match and classic items that I know I will grab for those early morning workouts before my brain is functioning. Happy Friday! The Sephora VIB Rouge sale starts today! It's been quite a week for sales and the one is one of my favorites! VIB Rouge members get 15% off the whole store April 13th-16th and VIB members get 15% off April 20th-23rd. It's really easy to join so if you're not already a member, you can easily join to be a VIB member during the sale! I think this is a great time to stock up on your favorites or the classic items that you know you'll use up during the year. These are the item that I will definitely be stocking up on during the sale. Better late than never right? 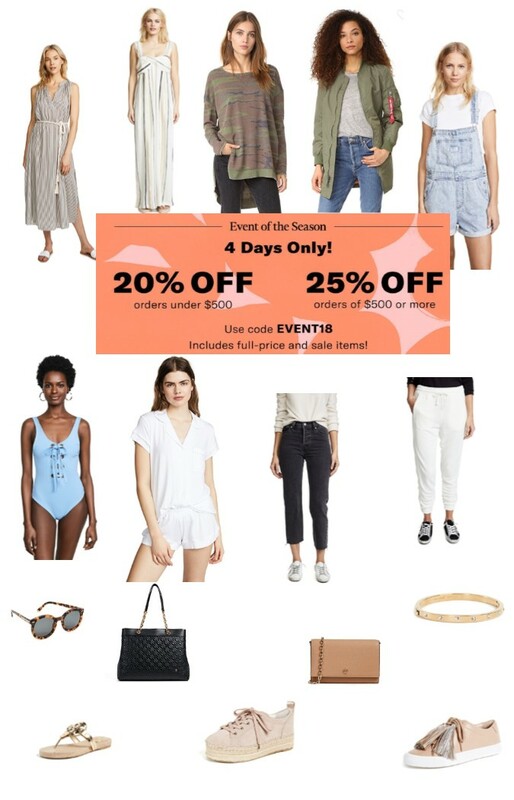 A day late and a dollar short, but here are my favorite picks from the Spring Shopbop sale! It's always a great time to stock up on your favorites since the more you spend the more you save. It's easy to do a lot damage! I love how easy it is to buy and return to Shopbop. Everything comes so fast and with return shipping so it's easy to try things out and even easier to return items that don't suit you. The sale runs through Saturday, but items are known to sell out quicky, so if you see something you like, don't wait! I am all about comfort these days. 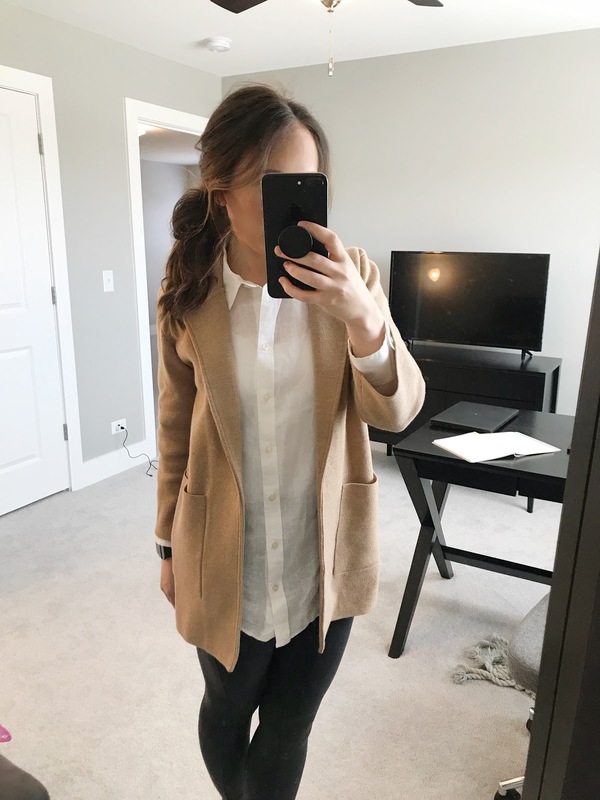 Working from home and being more casual on the weekends, I've found that I just won't grab for something in my closet unless I feel comfortable in it. These are the items that I'm constantly grabbing for. Sometimes you think demin, especially for women (think skinny jeans) and you think it's going to be uncomfortable, but all of these items are so comfy. My Madewell jeans are so soft that I just find myself grabbing them when I know I'm going to have a long day and want to be comfortable. I'm lucky that even when I do go into the office, I'm still able to wear jeans so I'll throw on one of these jeans and a sweater and still feel presentable. Happy Wednesday!! Hope you're all having a great week. Any requests for blog topics?! I'm always up for requests! These are my absolute favorite posts to read on other blogs and videos to watch on youtube. I seem to be just a naturally very nosy person. Bag - I have a few bags in my rotation, but love this one by Tory Burch, because it can easily be dressed up or used casually. It hold everything I need except my laptop (which I only carry a few days a week). Wallet - I switch between carrying a large wallet and carrying a small card holder. I'm finding recently that I love just having a small card holder and love this one by LV that attaches to my keys. Sunglasses - While I usually keep a pair in my car, I like to carry a pair with me just in case. 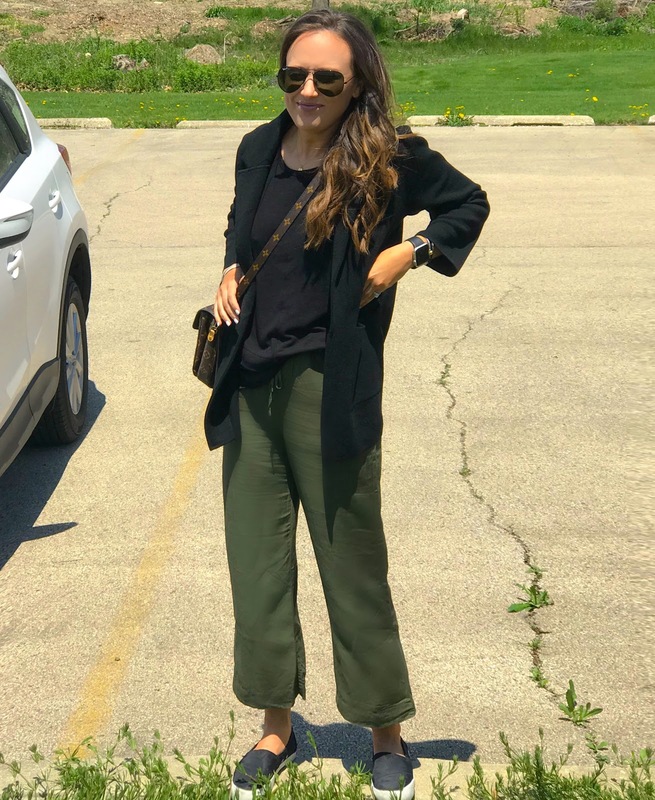 It seem like every post I've written, I found a need to write about sunglasses, but they're just an everyday essential! Small cosmetic pouch - I have a few items that I like to have with me no matter what I'm up to. Lip balm, hand cream, Kleenex, Advil, Dramamine (I usually only need this when I'm flying, but I always seem to forget it so I just keep it in my bag at all times, just in case! ), sample size mascara, a lipliner, lipstick, and at least one lipgloss. I also like to throw in a compact, while I usually don't end up needing this, but it's like a safety blanket to me.